This week Brian Davis published a video from his GBC module, "Gates" of its name, which was displayed at Brickworld Chicago 2013. This is a mechanical logic GBC module with about 28 ball-activated mechanisms, 212 distinct ball paths, which mechanically counts up to 169.999 balls. It was part of a much larger GBC chain (with 50+ modules), but it was the largest single module by far. 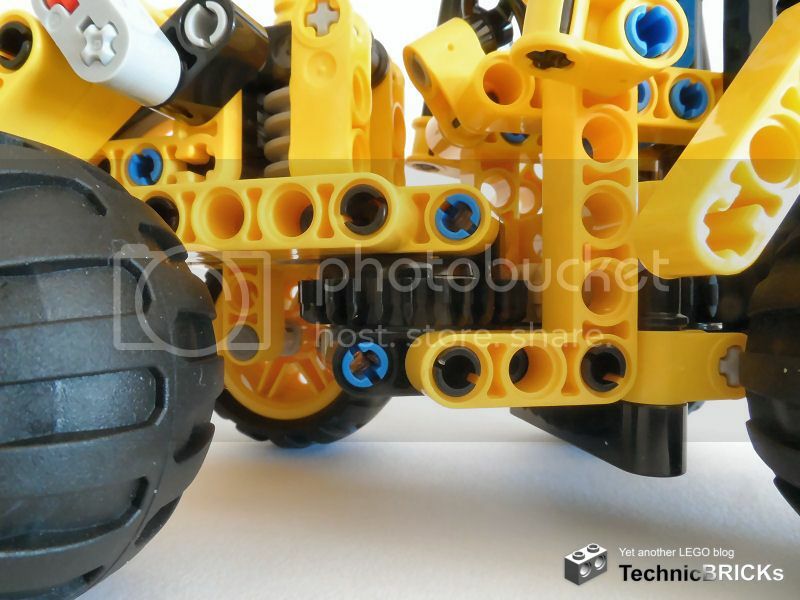 It won the 'Best Mechanical' award at Brickworld Chicago this year, and it took 1,5 years develop and some more to plan the mechanisms. The only motors are used to lift the balls - all the ball sorting, re-routing, and counting is done purely mechanically by ball-activated mechanisms. Brian also published one video where he shows some of the prototypes of mechanisms used in the GBC module 'Gates'. These mechanisms alone, should have taken about 90% of the whole module development time before achieving the high-reliability required to put all them together and testing the whole mechanical computer module. The video shows modules for a Cascaded Flip-flop (divide by 4 mechanism), Dumper (divide by 5 mechanism), Decade counter (divide by 10 mechanism), Hold Five (waits for 5 balls), Avalanche Gate (flexible alternative flip-flop), Divide by Three Mechanism (tightly cascaded Y-gates), Latching Gates (Set/Reset dual-layer gate) and these are only a few of those used in the "Gates" GBC module. Better see the video to understand how all these work! It is not the first time that Brian builds a "marble logic" computer, and as you can see by the date of this post, he might have been thinking on how to fit it into a GBC scenario, for many years now (at least 5 since the mentioned post). After 3 sessions and about 8 hours net time building, speaking and taking photos, the 42009 (Mobile Crane MK II) Live build session are now finished. Then I'll proceed with a review, here on TBs . Thanks to all of you attended and participated in these sessions with your comments and interaction through the Ustream chat interface. With some ups and downs, the third session was finally very successful and running without significant technical problems. It seems we're successfully learning how to do it as we practice. 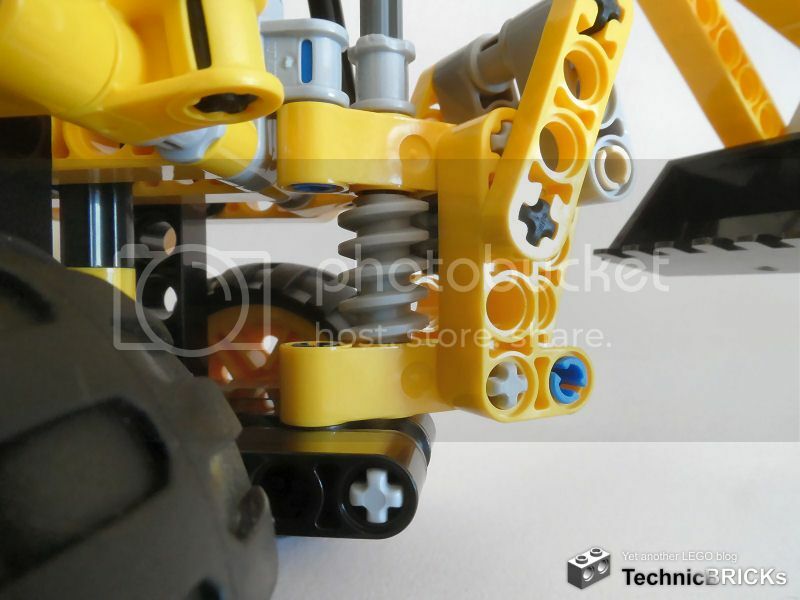 Some of the videos recorded live are now available trough the TechnicBRICKs Live Stream Channel and you can see offline how it ran. Hence I've disable the Google+ comments here for now, and you can enter your comments again! After having failed with session II, because my laptop had crashed and the old one does not have such a strong WiFi connection that allows live video streaming, from the distance where I've my new LEGO workshop to the router, here we are again for a final attempt with the recovered laptop. At the moment we have the truck with functional steering and motorized outriggers, plus part of the superstructure. We are missing just the 6th book (81 pages) with the telescopic boom for the 42009 (Mobile Crane MK II). We will return today (2013.Jun.21, Fri) at 22:30 CEST*, to continue this live streaming and complete thebuilding process of this great model. The USTREAM chat window will be available next to the live video, where you will be able to raise your questions and I'll try to answer them as soon as I can - please notice there is also a few seconds delay in the live broadcasting. In the late afternoon my laptop got a blue screen followed by a major crash, and didn't startup anymore (hopefully it will just need a reinstall). Within a short time I tried to improvise and setup everything with an old laptop. But as you have seen, for some reason there were several technical problems and the performance was really poor (noise trough the mic and the video was lagging simply too much...). Will let you know here, when I get ready to continue. And again, sorry for any inconvenience! We have now completed the first session of 42009 (Mobile Crane MK II) building live stream. It was a great sharing experience on this side, and the interaction with you really paid off! After 6 hours of intense building, chating and taking photos, we have completed the first 4 building instructions booklets. It remains the book 5 (34 pages) and book 6 (81 pages). We will return tomorrow (2013.Jun.19, Wed) at 22:30 CEST*, to continue this live streaming and complete thebuilding process of this great model. 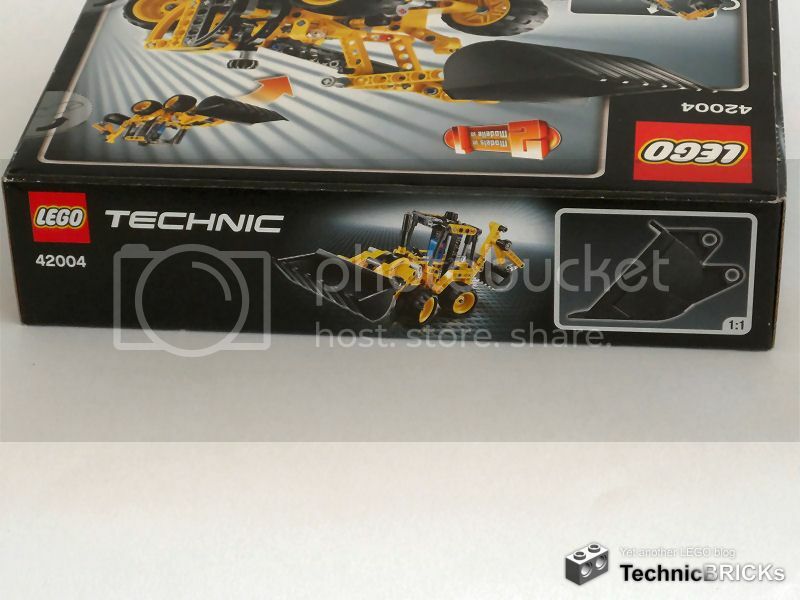 The live building presentation of this LEGO Technic novelty, will likely be split in more than one session. Further details to be communicated as needed. 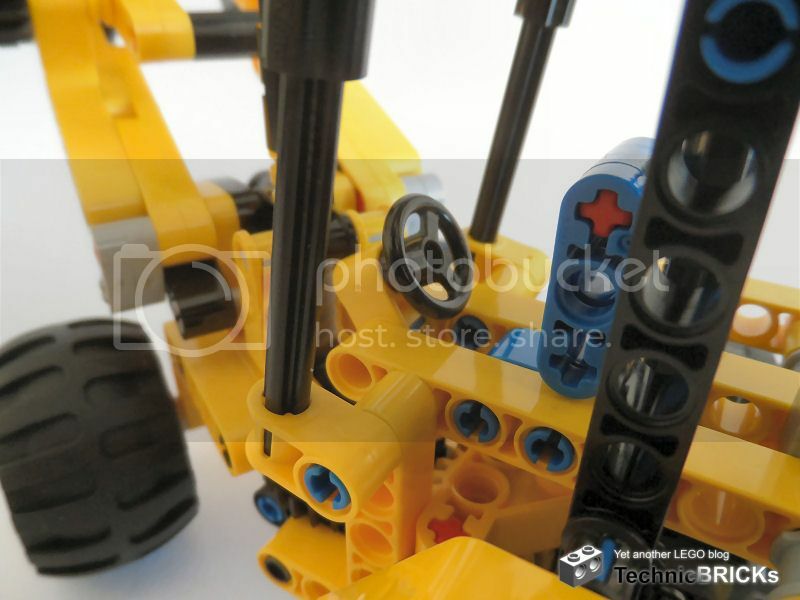 Tomorrow (2013.Jun.18, Tue) at 22:30 CEST*, we'll be live streaming the LEGO Technic 42009 (Mobile Crane MK II) building! 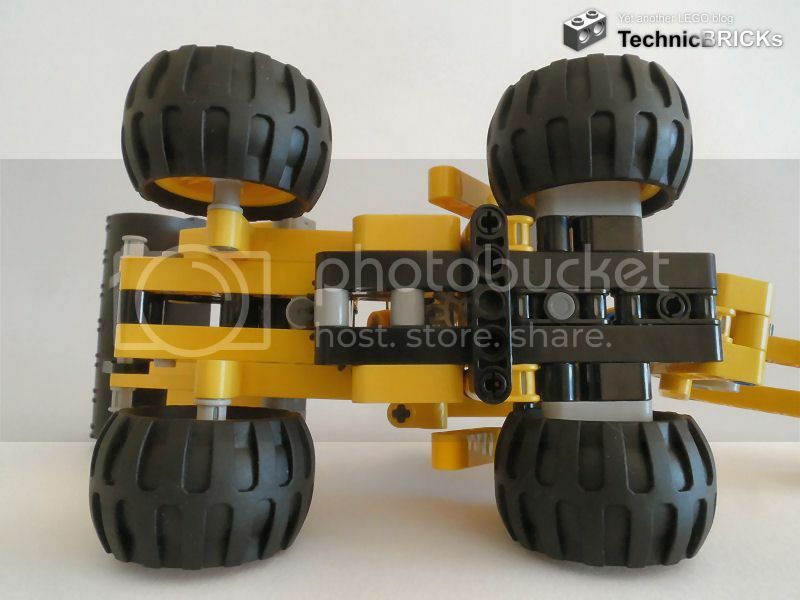 While we, TBs crew members, were doing some messaging among ourselves, someone mentioned the B-models for sets 42001 (Mini Off-Roader) and 42005 (Monster Truck) maybe still unknown (likely). I'm not sure whether this really the situation, but here they are anyway (just in case...). As you can see, B-model for 42001 doesn't differ much from main model and it looks still a Mini Off-Roader. On the contrary 42005 main and B-models have some substantial differences in appearance. 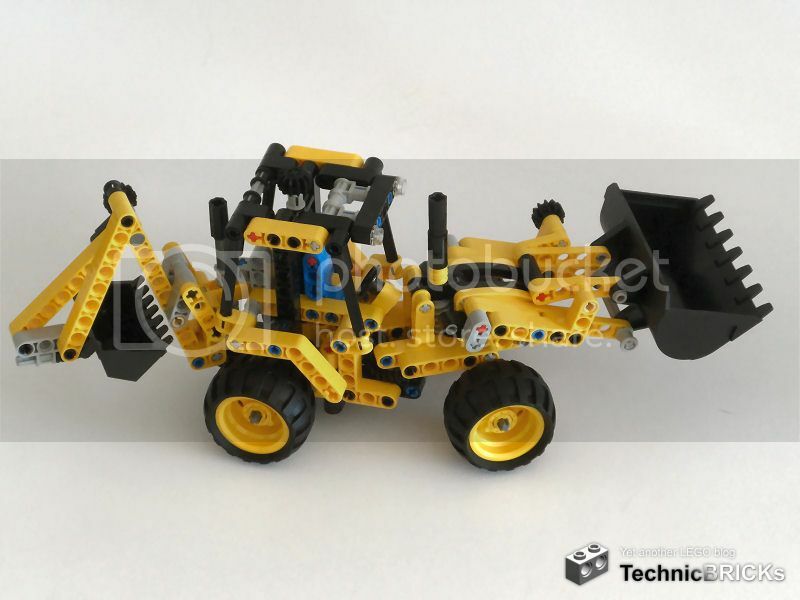 Following the apparent trend of launching "Mini" versions of previous sets (the most glaring being the 8110 Mercedes-Benz Unimog U 400/9390 Mini Tow Truck duo), after last year's 8069 Backhoe Loader, 2013 brings us its minimised version, the appropriately named 42004 Mini Backhoe Loader. It could be said that the "Mini" prefix doesn't refer just to the model's size, but also to the real machine's size. The similarly-sized wheels and the method of steering feel like a machine with a smaller calibre than its bigger, last year's brother. 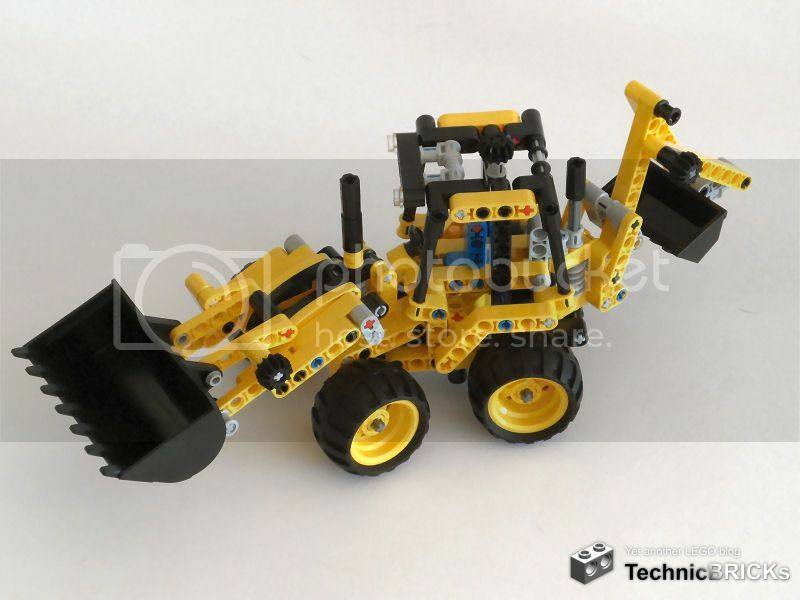 As can be expected from a construction machine, the model is primarily yellow, with some black details here and there: besides the obvious tyres, there's also the centre section of the bonnet and the steering wheel. Thankfully in my opinion, there are no atickers around to complement the model. 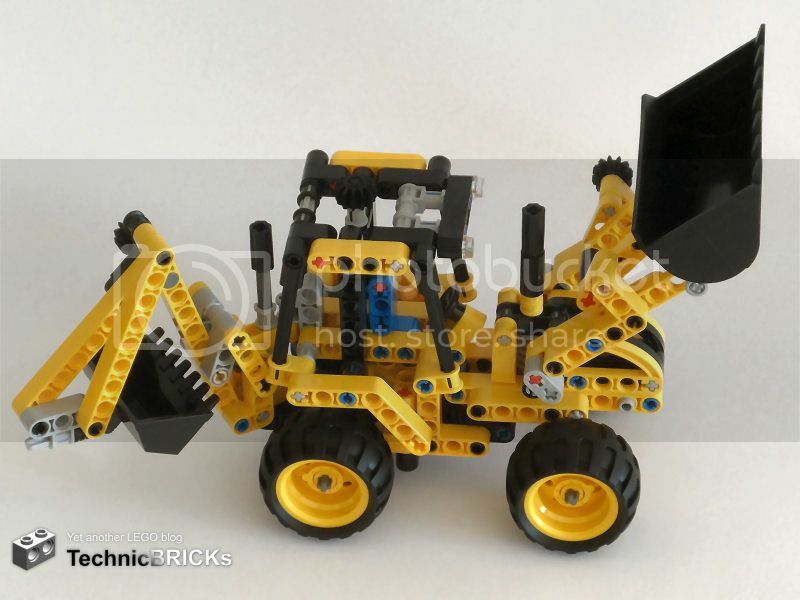 The model has a shape that can instantly be recognised as of a backhoe: the large, wide loader bucket in the front, the bonnet with a chimney, the four all-terrain wheels, the digger arm in the rear. 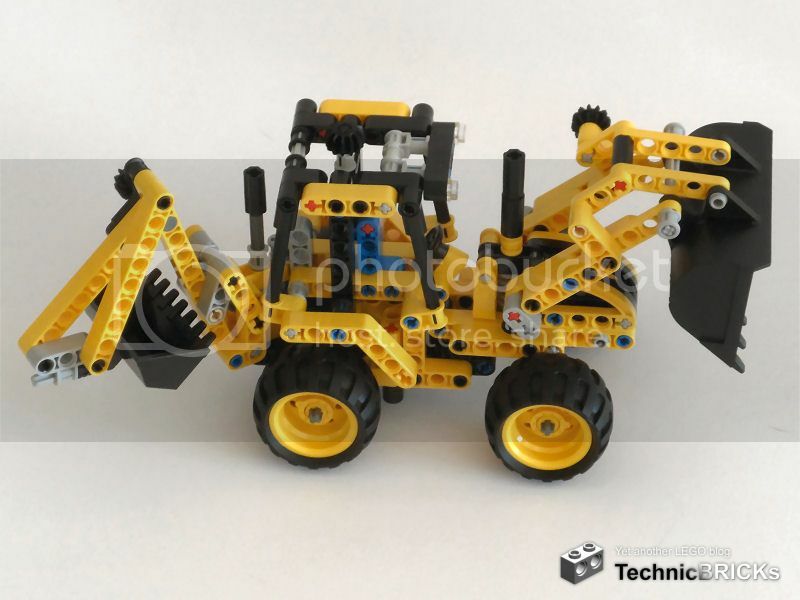 Its proportions seem right for a smaller model of backhoe; however, the front bucket seems too narrow for the tyres. Or are the tyres too wide? Anyway, speaking of the tyres, they are definitely too thin for a construction vehicle meant to go on not so forgiving ground. They almost feel like a "backhoe tuning" job! And, while the front bucket is too narrow, the rear one is too wide. Backhoes usually have a narrow rear bucket for excavation purposes; for an example, see the 8069. This can be justified by the fact that both buckets are dedicated parts instead of built from other parts: therefore, there's not a very large choice of available sizes to fit the scale of the vehicle. The driver's compartment features a seat in the traditional Technic blue and a small, adjustable steering wheel. The steering wheel is decorative only and can't be used to steer the model. The ground clearance, as expected for this type of machine, is high. There are no parts whatsoever below the level of the wheels' axles, except for a lone 5L beam that sticks out like a downwards-pointing thumb, which it figuratively is. Unlike the 42002 Hovercraft reviewed earlier, I felt that the box came had the usual (low) density, being no smaller than the boxes for previous sets of the same size. However, this is a very subjective analysis and shouldn't be taken too much in account. 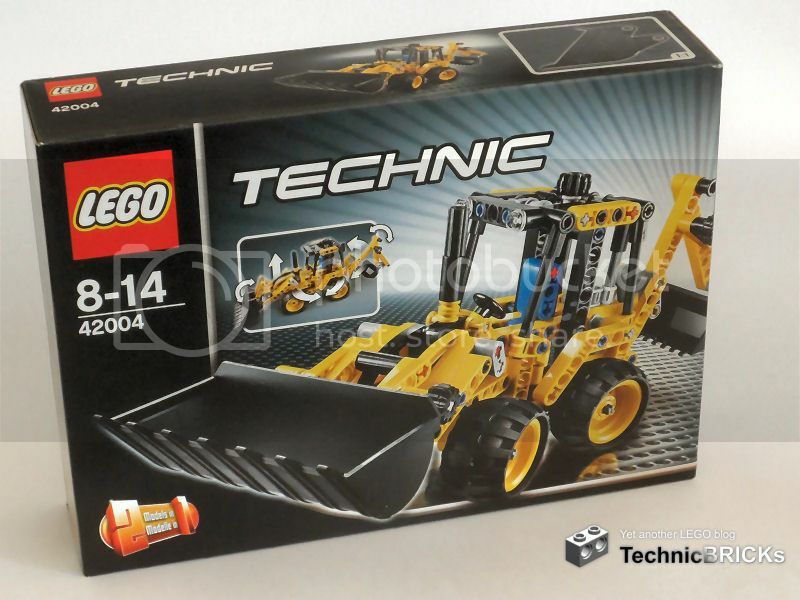 The front of the box shows, as usual, the main model, a smaller image showcasing its functions, the LEGO and Technic logos, the set reference and name, recommended age range, number of parts, the "2 models in 1" stamp, and, in case you forgot what a LEGO set is all about, the mention that this is a building toy. Boxes meant for other markets may vary slightly in the contents of their front. 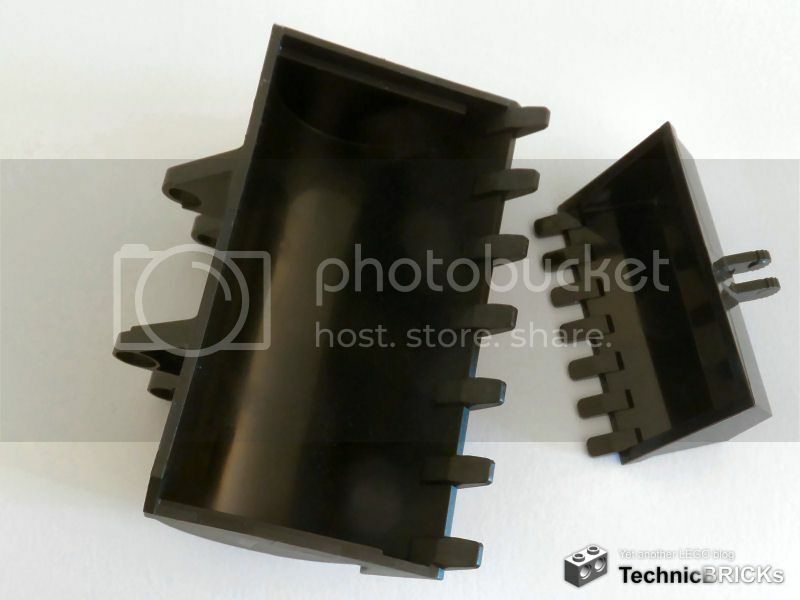 The top shows the usual 1:1 image for scale: in the case of the 42004, it's a side shot of the front bucket. 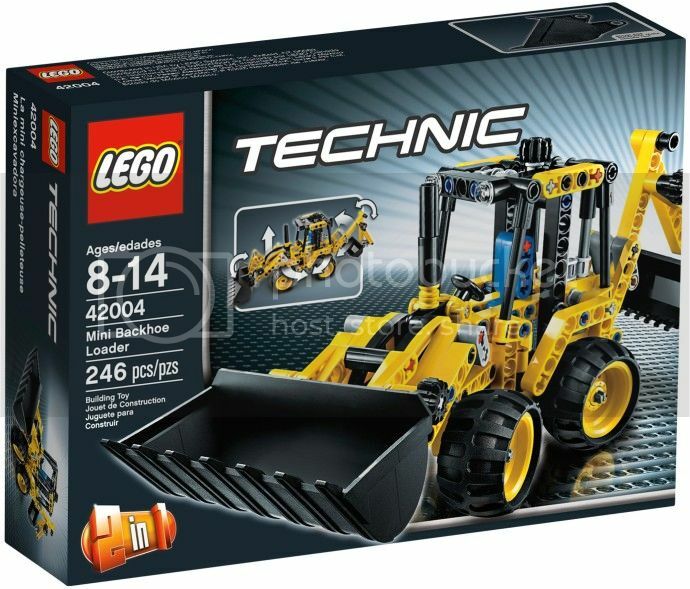 The back of the box shows the B-model, a telehandler. 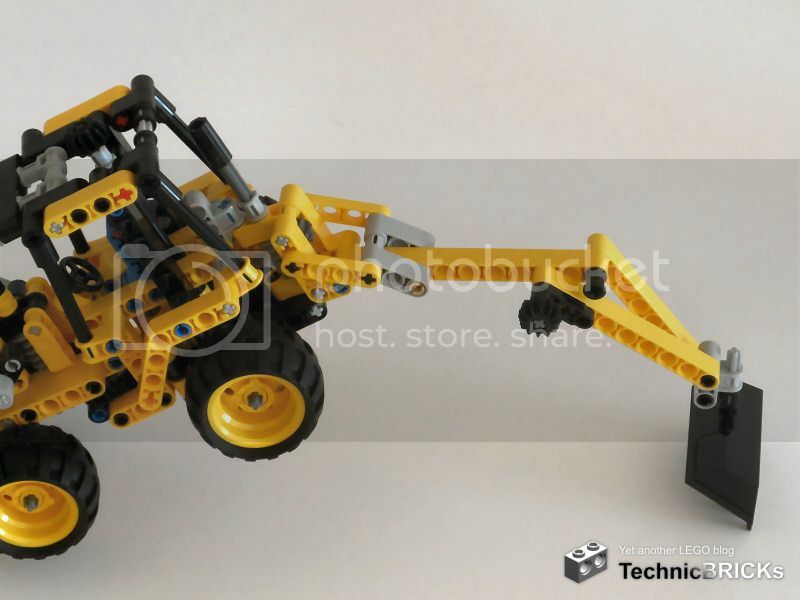 The "2 in 1" stamp and the small image of the A-model convey the notion that the telehandler is built using the backhoe's parts. In the corner, the telehandler's functions are shown: steering, lifting the boom, and tilting the bucket. As usual for sets of this size, the box is opened by tearing up one of its sides. 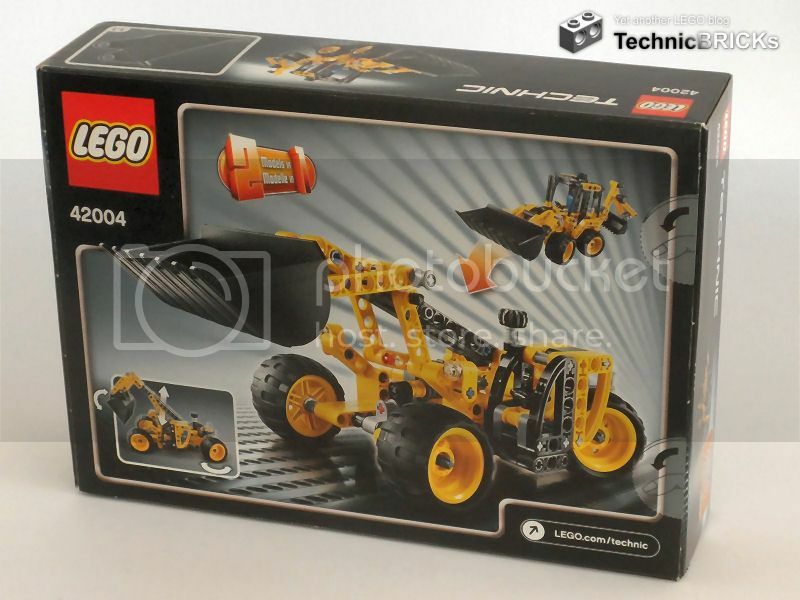 Inside we find that the box is tightly packed with instruction booklets (unlike larger sets, instructions for both models are included), three unnumbered bags with the parts (the smaller bag is inside the larger bag), the tyres and the large bucket. Strictly speaking, there are no new parts in this set: everything has appeared on previous years. 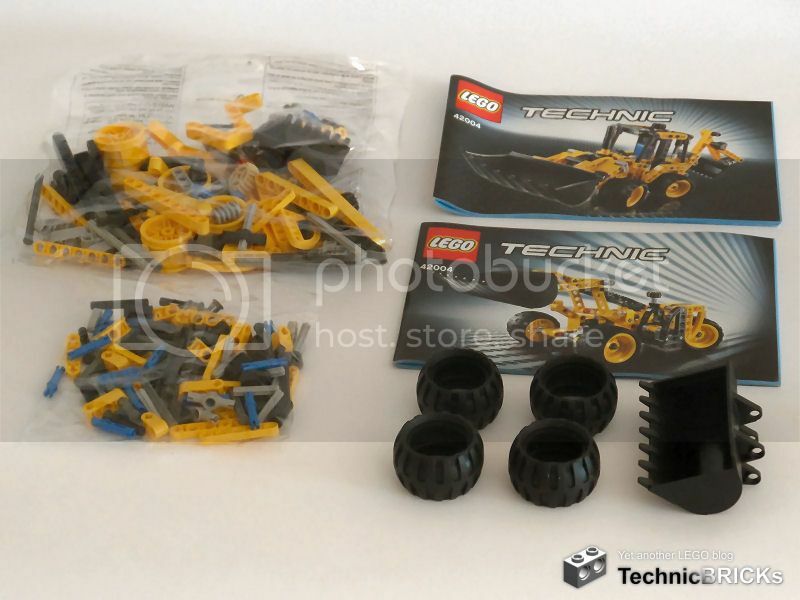 However, like other 2013 sets, it uses a new mould for an existing piece: the 8T gear is of the new variety, which is better in every way (except perhaps being a few percent heavier, but that's nit-picking) than the old one, especially in terms of robustness and not hiding away inside the holes in beams. Unfortunately this set has only two of them, but as other new sets come out this part will become more abundant. This being a small set with no new parts for 2013, not much is to be expected. 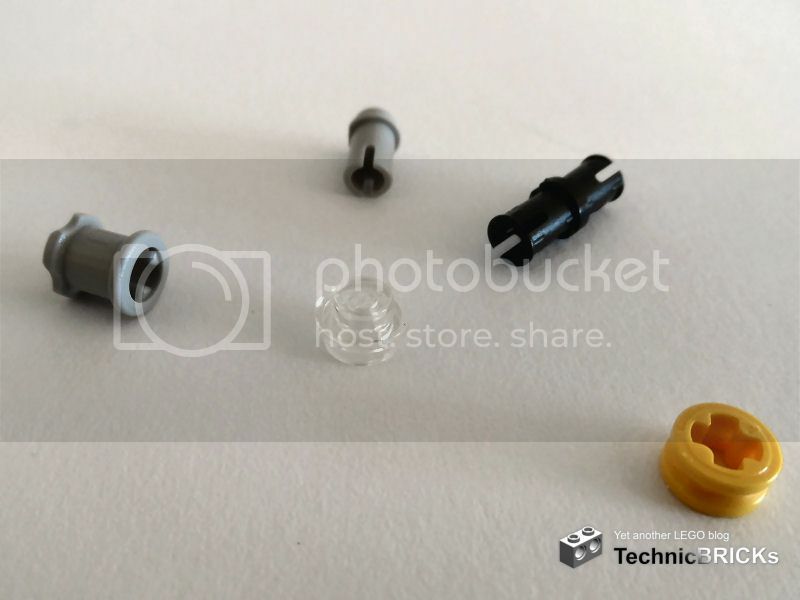 Besides the aforementioned new 8T gears, parts of interest are the four wheels (being the same size can be an advantage for MOC's), a small turntable, and perhaps the small steering wheel and the two excavator buckets. Following the now usual "instructions on how to follow instructions" first page of the instruction booklet, I separated the parts and am now ready to start construction. 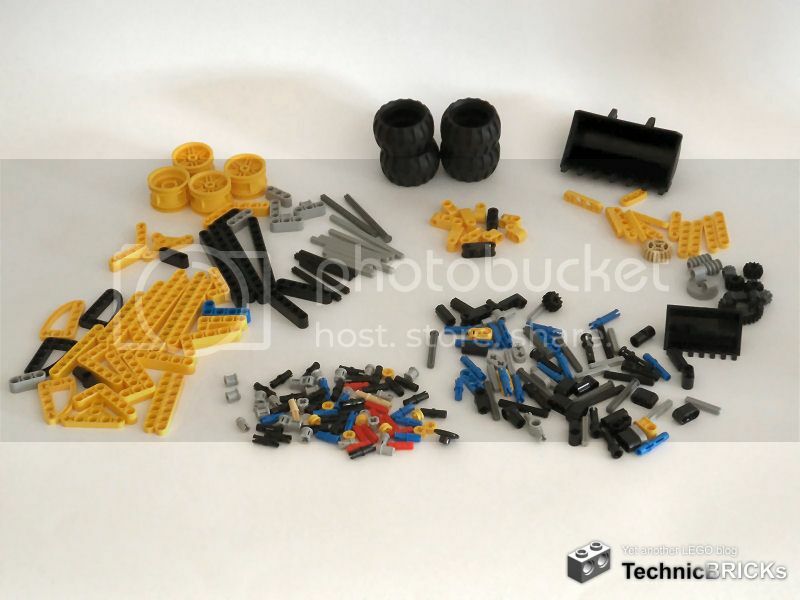 That's also the opportunity to have a general idea about that types and quantities of parts in the set. There are no particular highs or lows when building the model. Of note is the abundance of large chunks that are assembled before being integrated into the main model. Like on the previous review I wrote, the LEGO magic is at work here and the model assembles itself. After the 47 main steps, we're done! With no stickers or printed pieces, all detail is ensured by shapes and colours. These are the spare parts that were left. 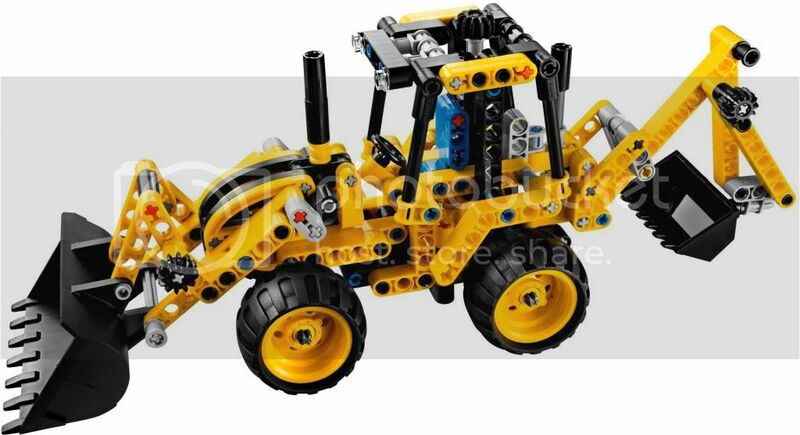 Unfortunately there's no third 8T gear for MOC's. For a set this size, there is really lots of functionality! Six functions in total, although most are barely mechanised, if any at all. First, we have the most complex function in the model: steering. The 12T gear at the top drives a vertical axle connected to another 12T, which meshes with a 20T and then into the small turntable. This results in an easy to operate steering, without being overly sensitive or lazy. Next, we have the rear digging arm. Turning the vertical axle joiner makes a worm gear rotate, which then turns an 8T gear, and raises one part of a four-bar linkage that moves the arm's boom. The front loader arm uses a similar worm-8T coupling to raise it. 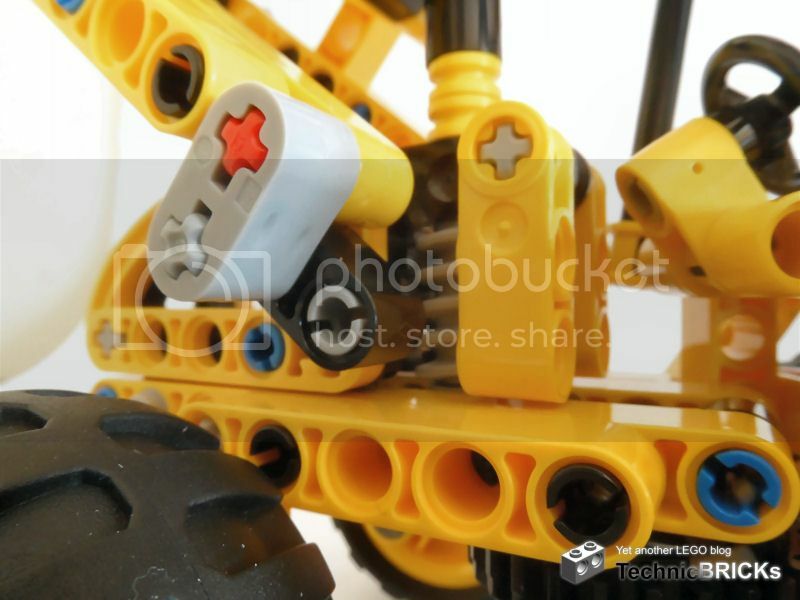 However, in this case there is no linkage, and the 8T gear drives the arm directly. Also, the axle joiner here is disguised as the backhoe's chimney. The gearing down on the mechanism (8:1) is too small for the weight of the arm, which makes it very hard to rise it. As you can see in the video, I had to hold the model with one hand while I raise the arm with the other. The worm gear should be mated to a larger gear, like a 24T instead of the 8T, to make the mechanism easier to actuate, but there would not be enough room under the bonnet for it. Then there are the simpler functions, actuated by knobs (made using more 12T gears) directly on them. Again, the one on the rear is more complex and the one that more positively surprised me. Turning the 12T at the arm's "elbow" deforms an antiparallelogram (a kind of four-bar linkage where two of the bars are crossed). This raises and lowers the arm's jib, while simultaneously turning the bucket at the end of it for a "digging" motion. This is why manually rotating the bucket around its click hinge is actually unnecessary for play and therefore I don't consider it a function on this model. Note that you can dig quite deep holes with this arm, as it has a considerable reach. The front bucket can be tipped with a mechanism similar to the one found on the 8235 Front End Loader. When tipping the bucket, the linkage goes over centre, which means it can't be tipped by accident. 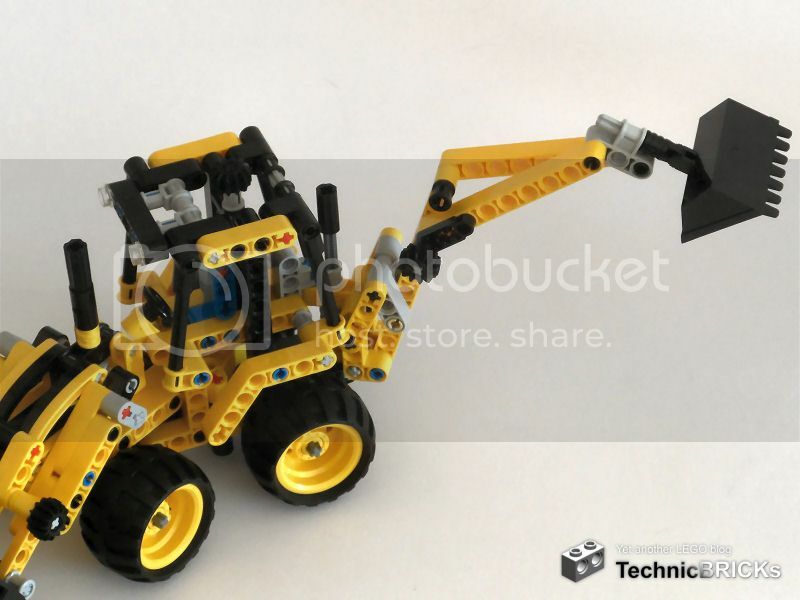 You can raise the front wheels off the ground by tipping the bucket when the arm is down; real-world backhoes do a less extreme version of this for stabilisation during digging operations. A peculiarity of the tipping mechanism is that, when the arm is down, it can't maintain the bucket completely tilted up because it hits the bonnet. You can see that in the video and below. Fortunately that's not enough to force the linkage to go over centre, and so it remains stable. Finally, the last function is a wholly manual one. Like on real backhoes, the rear digging arm can slew left or right, around two friction pieces. There is no mechanism whatsoever, apart from your hand, to accomplish this, and the range of movement is extremely small; yet, it is a very nice feature to have in a model of this scale, so there are no complaints here. The B-model is a telehandler. It features a very flat body, with rear wheel steering, driven via a Hand of God 12T gear at the top. The arm rises via a four-bar linkage actuated by a worm-8T pair like on the A-model, and the large bucket tips using a linkage also similar to the one on the A-model. Like it, there is no chance of accidentally tipping over. The asymmetrically-placed cabin features a steering wheel but no seat. Unlike some sets I won't mention, this B-model looks quite nice. Its functions are in a much smaller number than on the A-model, but that's not because they're few; that's because they're so many on the A-model. This set offers a surprising amount of functions for its size. As, mechanically speaking, it would be a euphemism to call these functions "simple", an adult may find them uninteresting. 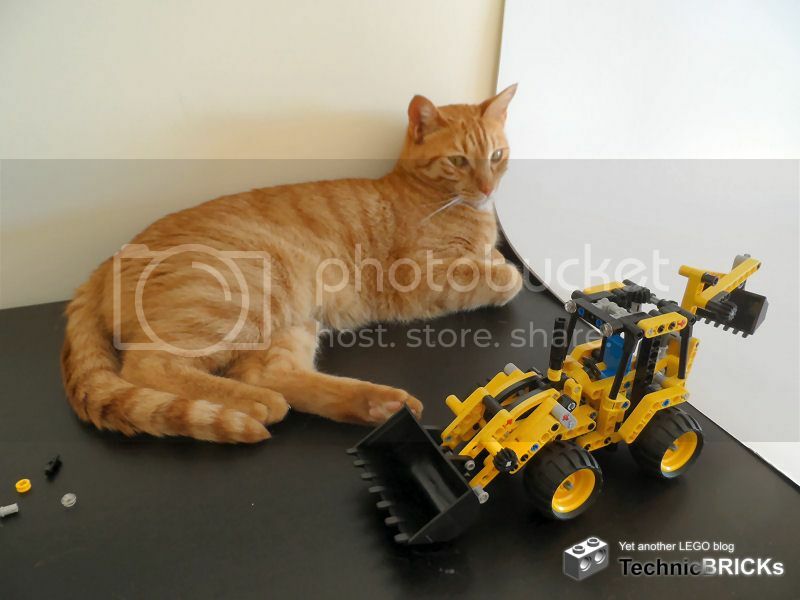 But a 8-14-year-old kid, the target audience, won't mind that and will surely enjoy playing with the model, digging up piles of bricks and loading and unloading them. I'm just not sure if all 8-14-year-olds will have the skills to put together this bigger-than-smallest set. But that's what parental help is for. The B-model, although comparatively weaker than the A-model (that's expected from a B-model, right? 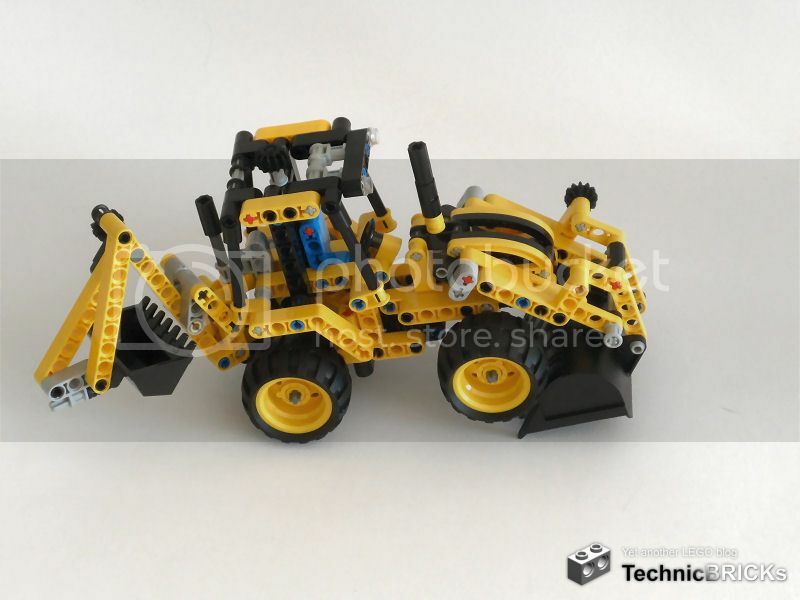 ), appears to also be good and perhaps worth of buying a second copy of the set to have both models built and working together at a construction site. Speaking of parental help... I must confess that I had the offstage help of one of my kids during the building, photographing and filming session. Depending on what you intend to do with the set (playing with it or using it for parts) and what is your age, you may find this set either fun or "meh". 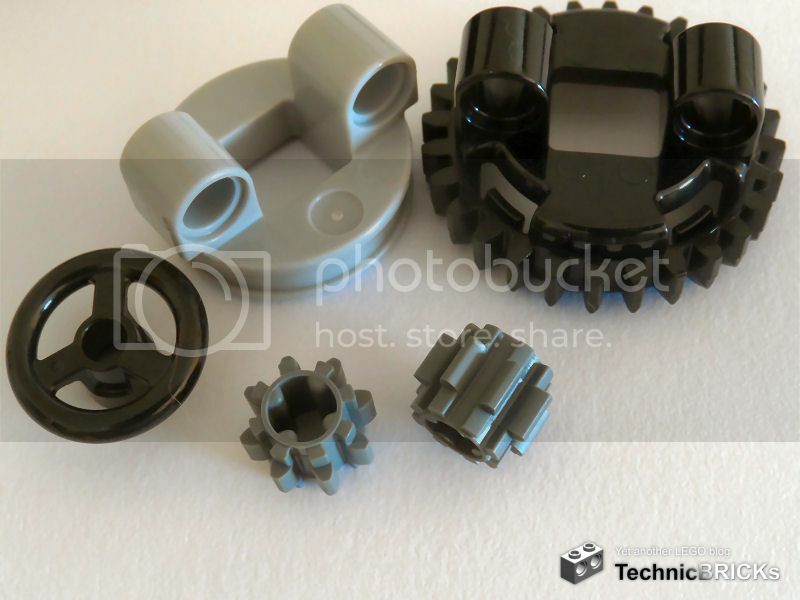 The parts selection is both very generic (mostly common beams, axles, gears and connectors) and very specialised (the two buckets) is literally a mixed bag; the wheels are also good or bad, depending on what you intend to do with them. 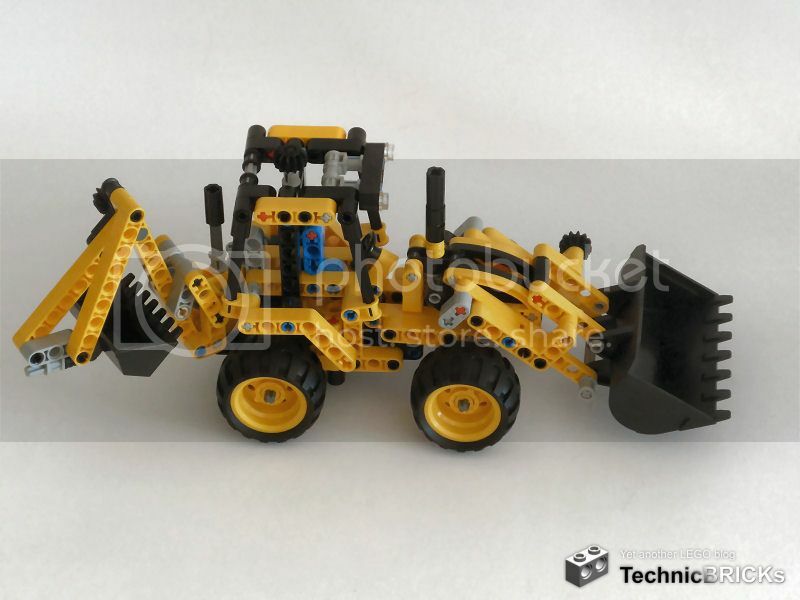 The set, while being just another in a long dynasty of Technic backhoes and excavators, has good looks and extraordinary playability for its size (only marred by the difficult front arm mechanism). This is first and foremost a set to be played with, not a parts pack or a mechanics lesson. 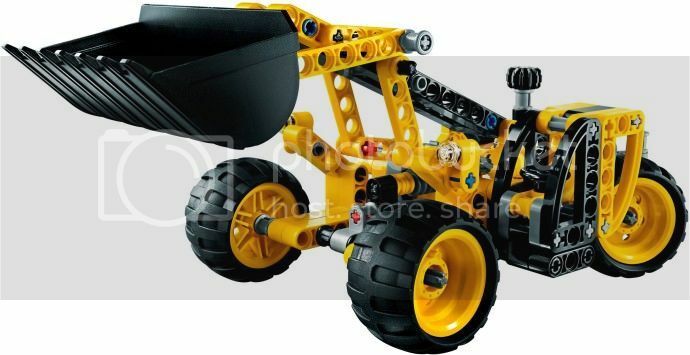 For this and for its size and construction complexity, I'd say that this is the ideal 2013 Technic set for parent-child team building.